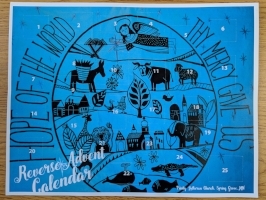 We invite you to pick up one of the Reverse Advent Calendars. The idea behind these calendars is much the same as your childhood calendar….there is a window to open each day with a message behind it. But here is the change….each day there will be a suggestion of a way that you can thoughtfully be celebrating Advent with acts of kindness, hospitality, and generosity. There is also a devotional booklet to go along with the calendar. At the end of Advent, you will have a box/basket full of great gifts for others. We will have a spot for collecting these gifts at the church between Christmas and Epiphany. On the Sunday that we celebrate Epiphany, we will bring our gifts as an offering. Following the service, the Outreach Team will distribute the gifts to the Food Shelf, housing shelter, etc.